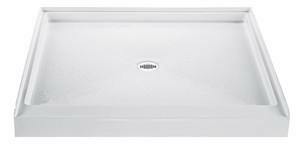 MTI Shower Pans offer clean contemporary design, unsurpassed quality and extreme durability. 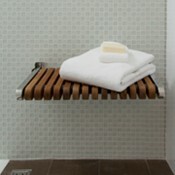 MTI produces a full range of high-quality shower pans and genuine teak accessories to match. MTI acrylic bases are attractive, easy to clean and blend with a wide variety of materials and decors. Choose from a generous assortment of sizes and shapes, including square, rectangle, rounded front, neo-angle and seated. Additionally, there are end-drain and center-drain models available to meet your specific installation requirements. Boutique Collection: shower bases high in both design and function, all handcrafted in SculptureStone™. 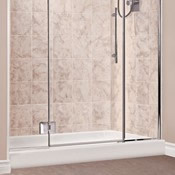 Designer Collection: a large assortment of premium quality shower bases handmade in durable cross-linked cast acrylic. MTI pans are constructed of Lucite® cross-linked cast acrylic with strong reinforced backing to eliminate flexing of the floor pan. They are attractive and easy to clean. Some are single threshold, and others are low-profile, multiple-threshold, which means that they can be specified from the factory to accept glass enclosures on one, two or three sides. The low-profile design not only presents a very clean look, but it also makes entrance and exit easier. Taking this one step further, if a zero-barrier entrance is desired, the low-profile, multiple threshold shower bases can easily be recessed in the floor. 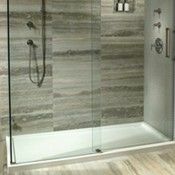 When used in combination with a genuine teak shower tray, a flat transition is created between bathroom floor and shower. MTI Boutique Shower Bases These solid surface shower pans are high in both design and function. MTI'’s Boutique Collection represent the epitome of clean design and exceptional craftsmanship. Constructed using MTI's proprietary SculptureStone™ material, these shower bases feature a hidden drain, blend with a wide variety of materials and are easy to maintain. All models are of low-profile, multiple-threshold design, which means that they can be specified from the factory to accept glass enclosures on one, two or three sides. The low-profile design not only presents a very clean look, but it also makes entrance and exit easier. • Optional Foam Base eliminates the need for bedding compound. 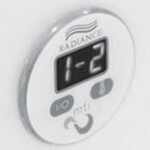 Radiance is the patented innovation from MTI that applies radiant heat technology to shower bases. Radiance utilizes electric heating grids to provide radiant heat for the shower base surface. 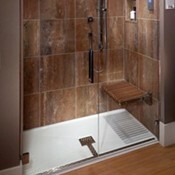 For shower bases with a seat, it will warm the seat and main area of the shower floor. 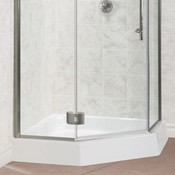 Radiance is factory installed and fully integrated in the acrylic shower base structure. It operates on 24 volts (5 amps) and plugs into a 110-volt, 15 amp GFCI outlet. Since Radiance uses only about as much energy as a standard light bulb, leaving it on will ensure a warm shower base whenever you choose to shower. The on/off control will require field installation. The control may be mounted on the wall inside the shower base, or mounted inside an adjacent closet or vanity up to 12' away from the shower. The transformer box will protrude into the wall cavity adjacent to the shower base. The box will need to be accessible for any future service needs. See drawings below for box locations. If an alternate location is required it must be specified when the order is placed. The outer edge of the shower base will be notched out at the factory, allowing the cable connecting the Radiance heating grids to connect to the transformer box. See Installation/owners manual for complete installation instructions. 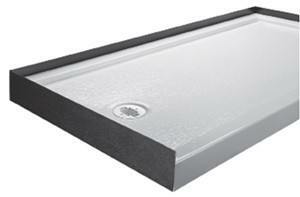 All MTI acrylic shower bases are available with a factory-installed pre-leveled foam base. This facilitates installation by eliminating the need for using a wet-bed compound to level the base. This foam also acts as a sound dampener and barrier. 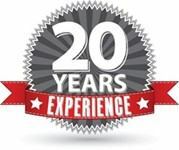 MTI uses high-density closed cell foam which will not shrink, crack or deteriorate over time. Field substitutions (e.g., Great Stuff) are not recommended and may void warranty. MTI Designer Collection shower bases include a tile flange to simplify installation. 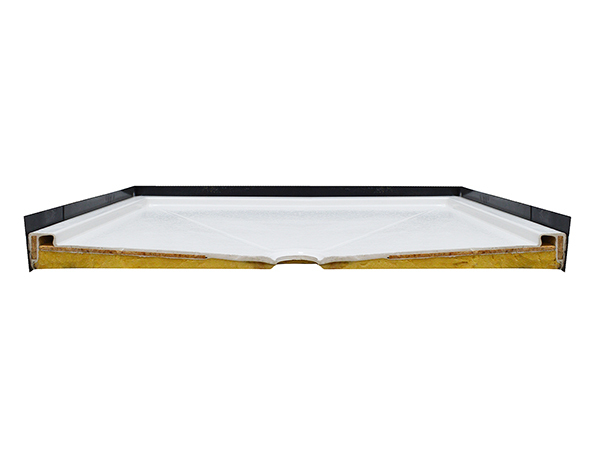 Multiple-threshold shower bases include a rigid ABS tile flange that is factory-installed on up to 3 sides and may also be ordered for installation on the job site, if preferred. 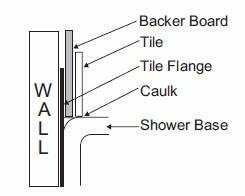 All other shower bases include an integral tile flange that is molded into the base. to screw to the wall studs and must be pre-drilled at the job site. Backer board will rest on top of the flange to provide an even surface for the tile. Rigid ABS tile flange is chemically bonded to the shower base at the factory. This not only facilitates installation but also enables a watertight seal on any sides specified. 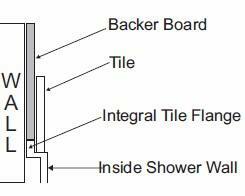 ABS tile flange can be installed on 1, 2 or 3 sides of shower base, depending on installation application.